Well, you all know that I am on the road and haven’t had time to put a proper post together but I couldn’t resist posting a bunch of pictures here so that you can ooh and ahh over something that I got see up close and personal today. I even got to take it back to my digs for the night to enjoy and photograph. My digs is a wee cabin on my friend Janet’s cousin’s winery in Santa Cruz, California…yes, one of the other Santa Cruces…..fields of grape vines flowing downhill and out of sight amongst a background of cypreses and redwoods with a view of the gorgeous Pacific Ocean with Monterey across the bay. There’s a whole lot more to that story, of course, which will have to wait but I thought I would post these pictures which really do have me speechless. 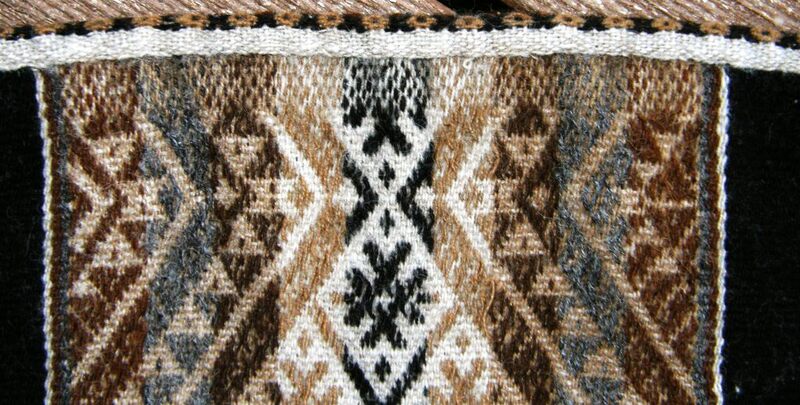 These pictures you have seen before if you follow my blog and you will, no doubt, remember that I became fascinated with the discontinuous warp technique when I met Pitumarca weaver Antonia at Convergence last year. There I got to see a piece being woven even though I didn’t fully understand at that stage what it was all about. At the Tinkuy de Tejedores in November in Peru I got to see more and even got to try out a plain weave piece of my own which I turned into the black and white eyeglass case above. Well, now, I have gotten to see, touch and fully enjoy and appreciate, after having woven my own very ridiculously basic version, a finished piece…and what a piece! It was lent to me by Martha Stanley to take home overnight and really study. What a treat! Okay, so I said I was speechless so, this is the point where I should really stop waffling on and just show you the piece! 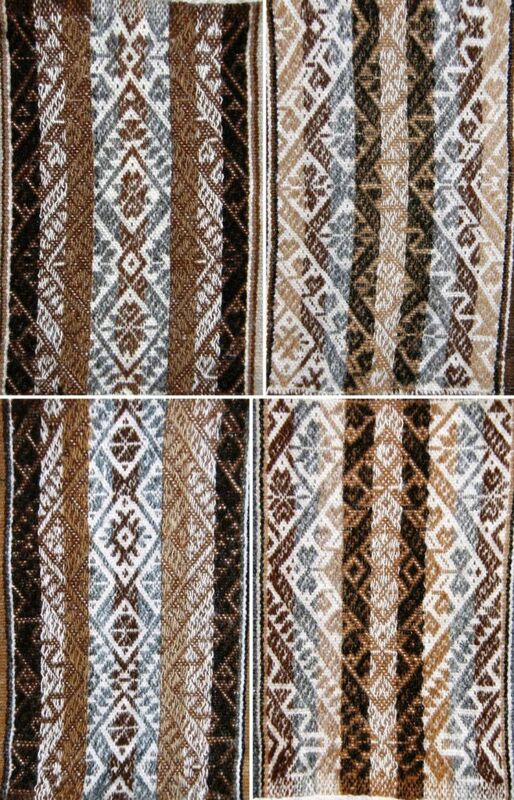 It has been woven in all natural alpaca with twelve panels of supplementary warp pick-up patterning, each one being a four-selvedged piece…incredible! 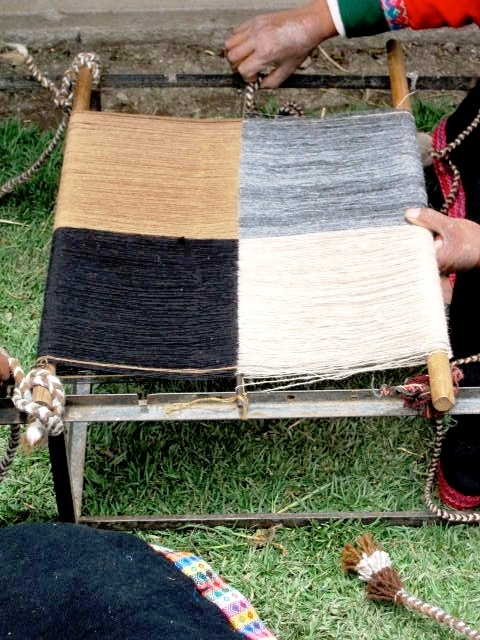 There is the tiniest terminal area in the top and bottom panels, which you can see below, where the weaver simply could not weave any more pick-up due to lack of space to manipulate the warps. 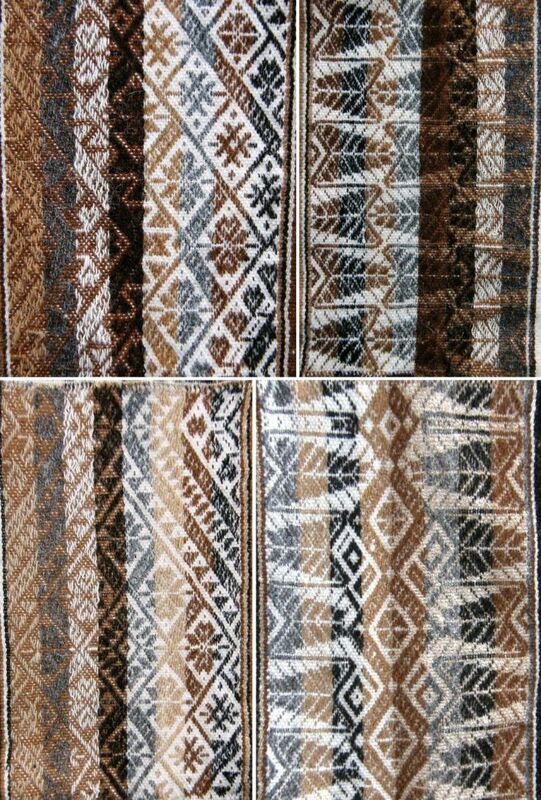 Each panel has a different traditional design of Pitumarca flanked by fields of either black, brown, grey or tan plain weave. 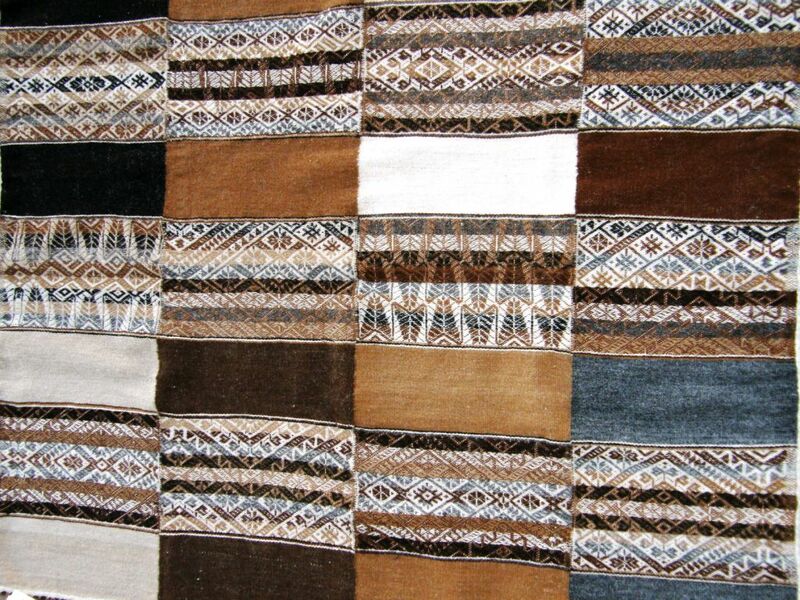 And, of course, it was woven as one entire piece on a backstrap loom. And here you can see how the warps from each color panel dovetail around a metal rod during warping which is what enables the weaver to have all these warp color changes within the one piece. Yarn is lying parallel to the rod which will stay in place to hold the dovetailing once the rod is removed. So, this is one of many cool things I have to show. I was given a entire bin of textiles to take back to winery and pour over…but that is all for this week! 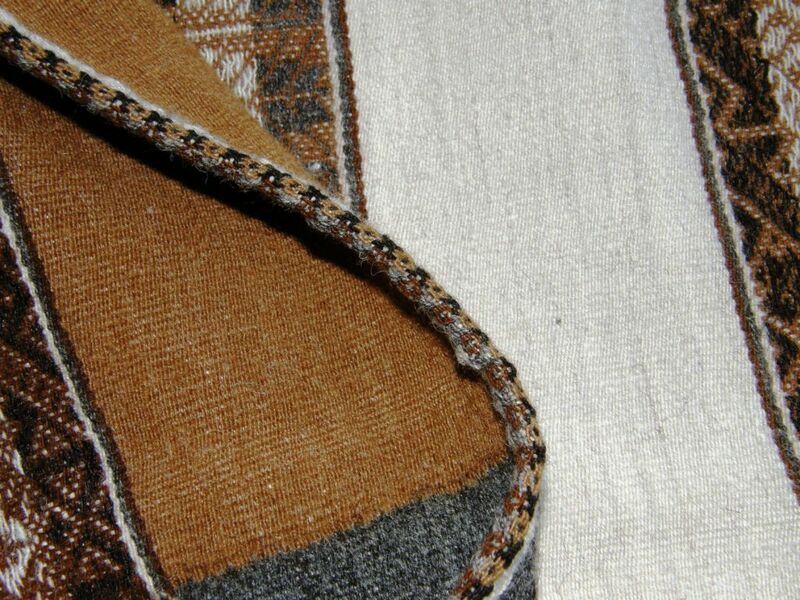 Oh wait, I have to show you one more picture of the woven edging on the piece…. simply whaow! What a beautiful piece, thank you for sharing. Mind-blowing! That is such a beautiful fabric. I can’t even begin to imagine the level of skill it would have taken, or how long to weave! It rather puts everything in perspective coming across true craftsmanship like this. But its also inspirational because it shows just what can be achieved by concentrating on the craft of weaving, instead of the latest bells and whistles, and thats not beyond anyone of us. Absolutely spectacular! And the skill and knowledge it shows…I am awed. Speechless 2. Thanks so much for the great pics! It makes me marvel at what can be accomplished with sticks and yarn. Thanks for including the picture of the four panel warp. It puts the technique back in the realm of possible for me. I hope you are having fun in Santa Cruz Calif! Yikes! This is spectacular! The technical perfection, the designs, the color arrangement — every bit of it is just astounding. Thanks so much to you and to Martha for letting us see this marvel. Yes, very humbling! Have a great time with Janet in Santa Cruz. Looking forward to seeing you here in Eureka next week. Oh my! very very nice show piece! that is an excellent “masterwork” of a weaver. I too am speechless. A work of hands and head. I am conquered! but how do they actually weave? How can they weave when they are close to the rod? Do they use a needle or what? I wonder, is it possible to buy some samples? Could you maybe do this for me? You seem to be just as amazed as I was! 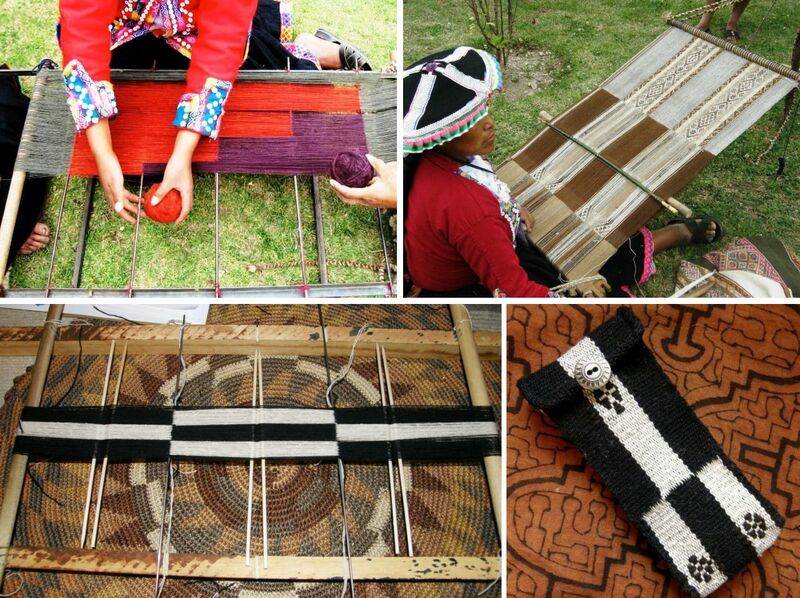 You are right, they finish the weaving when they are close to the bar with a needle. 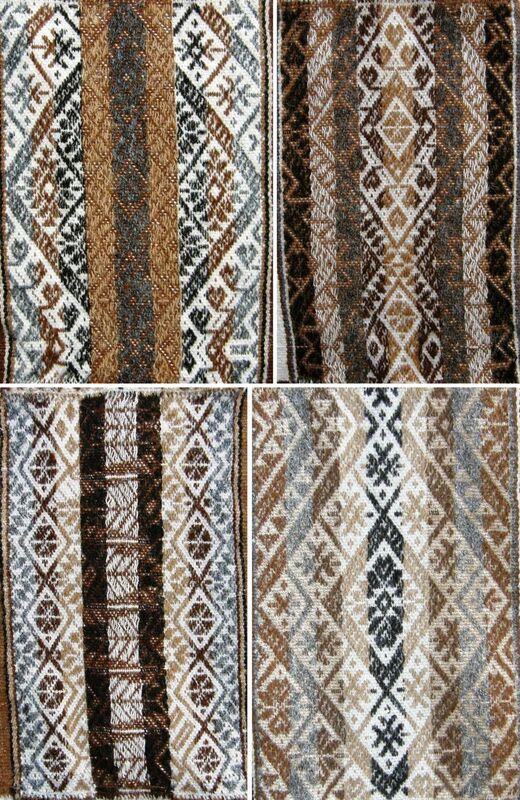 I am sorry but I don’t live in the area where these weavings are done so I can’t buy samples for you. 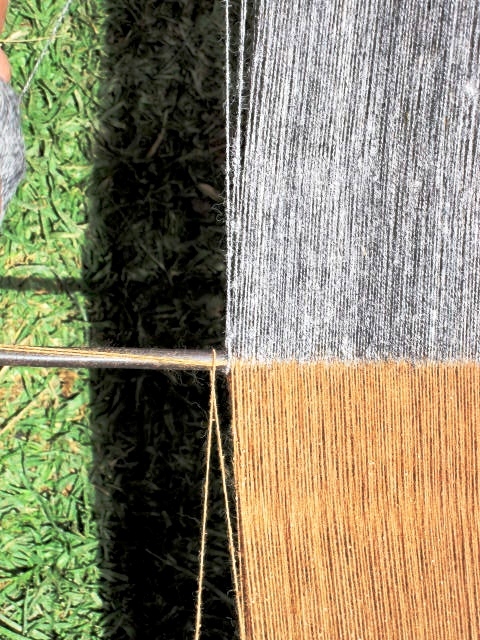 You could try looking at the site of Centro de Textiles Tradicionales de Cusco.